"This smooth and creamy ice cream combines the exotic flavor of lemon grass with the familiar texture and sweetness of ice cream." Heat cream, condensed milk, lemon grass in a saucepan over medium heat until mixture steams. Remove from heat before the mixture boils and allow to steep for at least 30 minutes, up to 1 hour and 30 minutes. Reheat the cream mixture over medium heat until it begins to steam. Whisk egg yolks in a small bowl. Temper the egg yolks by pouring a small amount of the hot mixture in while whisking constantly to avoid scrambling the eggs. Pour the warm egg mixture into the cream mixture. Continue to cook and stir until the mixture is able to coat the back of a spoon. Strain mixture through a sieve to remove the bits of lemon grass. Refrigerate until cold. Pour the chilled mixture into an ice cream maker and freeze according to manufacturer's directions until it reaches "soft-serve" consistency. Transfer ice cream to a one- or two-quart lidded plastic container; cover surface with plastic wrap and seal. For best results, ice cream should ripen in the freezer for at least 2 hours or overnight. Stout beer-flavored ice cream with subtle smoky, chocolaty flavors. I steeped the mixture for 1 hour. 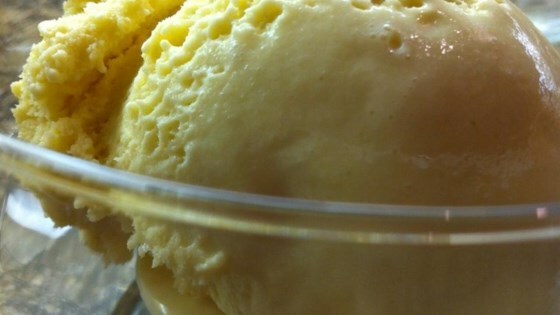 It was the perfect amount of lemongrass flavor in the ice cream. I love how creamy the ice cream turned out. I will definitely make this again! This turned out amazing. Followed the ingredient list exactly. I don’t have an ice cream maker so I put in the freezer overnight and it was perfect.